This tiny on/off switch is great for projects where space is very restricted. 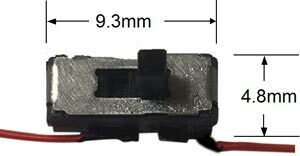 25 volt .5 amp rated, this slide switch can control up to 25 LEDs max. We have prewired the switch with 8" red kynar wires. If you have not added a switch to a project before, you add in the switch by connecting 1 of the red wires to the positive wire coming from your power source, the other red wire on the switch goes to the red of the LEDs you plan to control. Both red wires go to a red wire.